Leta Stetter Hollingworth was born in 1886 into a world that viewed women as inferior to men. 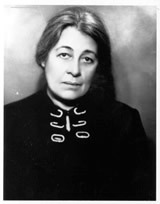 Hollingworth initially focused her career on the psychology of women, but later shifted her focus to education. She first went to school to be a teacher, but after marrying Harry Levi Hollingworth, she was no longer allowed to teach according to societal rules. Hollingworth was a homemaker for about two years when she decided that it was not fulfilling enough for her. With the encouragement of her husband, she went back to school and received her PhD in education at Columbia in 1916. Shortly after, she became New York City’s very first civil service psychologist and obtained the position of chief of the psychological lab at Bellevue Hospital. Hollingworth began work with E. L. Thorndike. Thorndike was a believer in the variability hypothesis. The variability hypothesis states that men exhibit greater variation than women on both physical and psychological traits. Hollingworth decided to disprove this hypothesis with empirical research. Her findings suggested that if there was a difference in variability, it would have favored women. After tackling the variability hypothesis, Hollingworth decided to write her dissertation on the belief that women could not be as productive as men during menstruation. She tested men’s and women’s performance on cognitive, perceptual and motor tasks for three months. Hollingworth found no empirical evidence proving a relationship between poor performance and the menstrual cycle. Thorndike, her mentor, was moved by her research and gave her a position at Columbia Teachers College. While she was teaching, she also began to study children of extreme intelligence and coined the term “gifted.” She wrote several books on education: The Psychology of Subnormal Children (1920), Special Talents and Defects (1923), and The Psychology of the Adolescent (1928). Her topics ranged from the belief that children who struggled in school often were smart, but had problems with adjustment to how to successfully educate gifted students. Hollingworth continued her research on gifted children up until her death in 1939. Her last study was published after her death, completed by her husband Harry Levi Hollingworth.